The Twingo is pretty appalling at motorway work and I do 50 miles on high speed roads every day. So I started thinking about what i’d want to replace it with. It would have to be interesting. Itd have to get better fuel economy at a high speed cruise while also being quieter and having a nice interior. Plus itd have to be as inexpensive as the Twingo to buy and be able to tow. X Type fits the bill quite nicely. 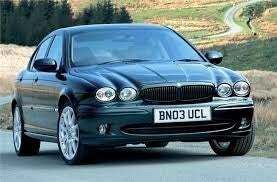 They use mondeo diesel engines which I know well and can get parts for cheaply, the interior is excellent for the money and fuel economy on the motorway is pretty good.